OH, PA and VA live performances! Here are some upcoming tour dates for mid to late August! So that took up a little over 3 months of 2016. What’s happened in the other say, 5?? Well, I’m working on completing… the NEW ALBUM. Yes, it’s slated for a November 1st release. It’s untitled as of yet – I’m trying to find common themes in the songs, as I did with the songs on “Love Ourselves”, my first EP. So title is TBA! Since I’ve been back in the USA, I’ve played some solo shows, and feverishly worked on string trio arrangements for songs on my new album. I went into the studio last week with my violin-playing friends Sarah Wilfong and Kristin Weber, who are wonderful people and players and just happened to be a part of the reissue of Roy Orbison’s “Mystery Girl” that came out in the last couple years. Needless to say.. they sounded wonderful, and my new EP will be all the more luscious because of them. There – now we’re all PLENTY updated! Oh wait, one more thing..
Other than some solo dates this fall, I’ll be touring with Canadian country singer Victoria Banks on her American acoustic tour. Victoria has had her songs recorded by Sara Evans, Mickey Guyton, and MORE. Visit VictoriaBanks.net/tour to see if we’ll be coming to a venue near you. Fall Tour 2015 was a serious success – from the Springfield Country Club in Alexandria, VA to the Rockwood in NYC, playing for all of you who came out to the shows was so satisfying. Thank you thank you thank you. ENTER INDIEGOGO. I know, I know, another crowd fund-er. But here’s the thing – SO MANY people wanted to help fund the new record that it seemed a shame to just let all those pledges go to waste. So with IndieGoGo, the financial goal is a little more reasonable, and my favorite part is this – THE GOAL DOESN’T HAVE TO BE REACHED FOR ME TO RECEIVE ALL THE PLEDGES. So there’s no pressure, no constant hounding. All the rewards are the same – posters, new t-shirt, house concerts, SWAG. Here’s the link to join the campaign, along with promotional video. 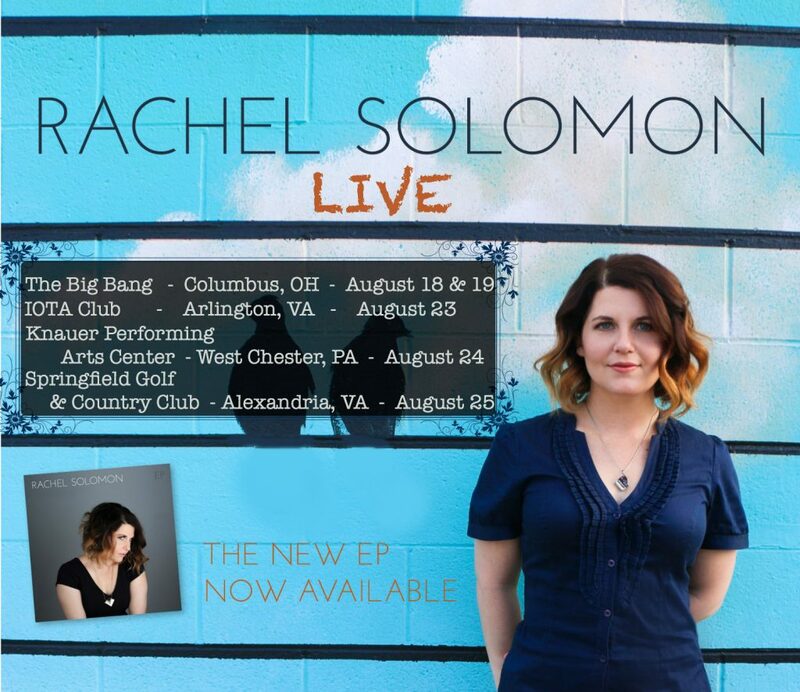 Click here to PLEDGE TOWARDS RACHEL’s NEXT ALBUM!! Click on over to AmplifierTV to listen to my solo performance of my tune “I’m A Ghost”. Why, you ask?? Guitar Center is sponsoring a contest for the next Great American Singer-Songwriter. Is it me?? Well I hope so!! Click click click click click click click click click! To start working on a new album!! Working with Kickstarter for my first record was such a success that I’ve decided to team up once more for my new one. This record is gonna be a departure from my previous.. and it’s gonna be COOL. By contributing to the Kickstarter, you not only pre-order the new record, but get access to exclusives such as t-shirts, posters, house concerts, personalized cover videos, read-to-be-developed cameras that have captured making the record and my Fall Tour 2015, and more. Watch the campaign video, then click the ‘K’ in the upper left corner to join in on the action. Take this next step with me! SUPPORT NEW MUSIC. This summer has been CRAZY!! I’m preparing for my fall solo tour, come October. (What is it about the fall that inspires me to get out on the road? ALONE??) I’m looking forward to seeing some parts of the country I haven’t been to in a long time, and have never played my material in. Keep an eye on my tour schedule to see if I’m going to play near you. Wanna know how I’ve spent the new year thus far?? With a sore throat. And pink eye, for God’s sake!! Professionally the year has started off slow-as-snails for me, but I suppose I can be thankful because I’d feel sorry for whoever hired me to sing backup for them at this time. As clogged as my throat is, I can sing at least two notes at one time. I have several dates booked for the coming months, mostly playing for other people right now. I’ll be playing several dates with Anna Haas, including her CD Release show on March 31st in Nashville at 3rd & Lindsley! The album was produced by Grammy-winning musician/producer extraordinaire Brady Blade (www.bladestudios.com/about), and has some heavy hittin’ singers and musicians on it (such as Ruby Amanfu and Jeff Coffin. Look ’em up!). I was on the road more than I anticipated last year – much of it on Toby Keith’s “Shut Up and Hold On Tour”, playing keys and singing backup for his daughter Krystal Keith (www.krystalkeith.com). The band was great, and it was a fantastic experience overall, and I hope for more it ASAP! Like I said, this year is getting off to a slow start. But I’m hoping this “down” time (though it hardly feels like down time at all) allows me the opportunity to write some new songs, cook some homey meals, and arrange Billy Joel tunes for an upcoming project in the works with some fellow Mustang Sally alumni (such as Mandy Shucher née Holbert – www.fclef9.com and Sarah Wilfong – www.sarahwilfong.com). For the first time, I’m going on my own tour. Just me, and the piano. I’m starting out small – but not really. I’ll only be on the road constantly from October 6th-October 19th, but I’m going to be hitting cities that are new to me, like Chicago and Madison. Truth be told, I decided to schedule this tour around one of my best friend’s weddings, which is happening just south of Minneapolis! So I’ll be traveling through and playing in some uncharted territory, but I’ll be cramming as many shows as I can between Nashville and Minneapolis. And back. Unofficially, the tour starts off… in Nashville!! I’ve put together a full band show showcasing myself and two other unique piano-playing writers: Anna Haas (in whose band I’ve been playing), and Phoebe Elliot. We’ll be taking over Two Old Hippies, a store/venue making a name for itself in Nashville’s Gulch neighborhood, on Thursday September 25th. As for the rest of the tour.. take a look at the complete schedule by clicking the “Shows” tab!! One of my favorite parts of my record “Love Ourselves” is the string section on the song “I Wanna Be Loved”. I envisioned this song as a big Beatles-esque production, and wrote the parts for what I thought came closest to that vision. My lovely lady friends Sarah Wilfong and Kristin Weber were the violin players on the record, and aside from playing on my record – they both played on (and Sarah wrote parts for) Roy Orbison’s newest song, “The Way Is Love”, released more than 25 years after his death. It’s available on the 25th anniversary reissue of Orbison’s last album, “Mystery Girl”. Here’s a lovely accompanying video to the tune. T-Shirt Sale!! Plus, 8×10 photos now available! Here in Nashville, we sort of skipped spring because it’s been so cold and went right into summer. The high today is 85! Take advantage of this sale by grabbing a 25% off, limited edition Rachel t-shirt. Also, 8×10’s just hit the store! Of course, they can be personalized upon request. 2014 began slowly but has picked up speed quite nicely. I’ve been playing keys for Broadway sensation, country cross-over star Laura Bell Bundy! She STARRED in Legally Blonde in the Broadway musical.. Her gigs have been a cool variety, and we as her band enjoy each other’s company and have great musical camaraderie. I’ve been playing various other gigs with country groups, wedding bands, etc. (When I’m asked what style of music I play, I respond, “Whoever hires.” 🙂 Well, not just whoever…) Groups like the NashVegas All-Stars, Frank Light, Anna Haas. I’ve been enjoying the patchwork of work I’ve got going on. Lastly.. for no specific reason, in December I decided to write a parody of international teen sensation Lorde’s song “Royals”, about living and working in music in Nashville. It was all in good fun. I accompanied the parody with a funny YouTube video, and it has garnered over 20,000 hits!! I’ve received 99% great feedback from it. And a pan from the Nashville Scene… Oh, and a 60+ minute interview with on-line music radio show, MachineFM! Below is the vid for which I am slowly becoming infamous, locally. The next parody is in the works, so prepare yourselves now! !